“The Canola Project” was an experiment in live, interactive theatre. A group of Albertan artists wanted to engage their communities with the theatre. And, they wanted to bring the “farm to the city.” As a result, “The Canola Project,” was born. 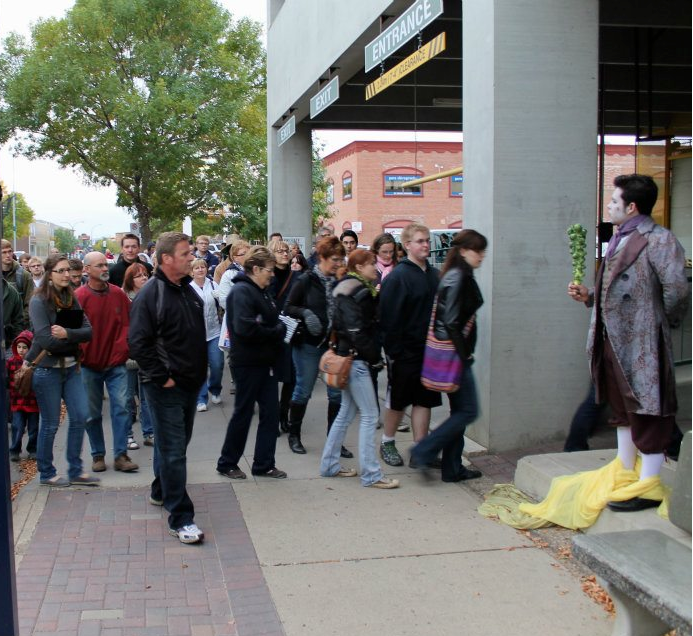 According to Theatre Alberta’s website, www.theatrealberta.com, The Canola Project aimed to bring community together through interdisciplinary, site specific performances. One of the goals of the project was to illuminate the effect of farm practices on the human geographical landscape of Alberta. I went to Red Deer today to watch the last segment. The Canola Project started with “Hibernation” back in April, 2011. Today’s segment was called “The Harvest.” The audience met at Veteran’s Park in Red Deer, Alberta. From there, we walked through the back alleys, following the lady holding the flowing yellow material. The wind cooperated by picking the material up and gently blowing it behind her. The yellow material represented the canola field. As the audience followed the canola around the backs of buildings, we were treated to performances by students in the Red Deer College theatre program. A farmer and his unwed daughter were seen in various poses, such as, harvesting the fruit off the trees and clearing the land of rocks. One of the characters stands at the entrance to the parkade, welcoming us with a stalk of brussel sprouts. One individual represented a time before Canada was settled. We saw him frequently digging through the garbage bins in search of “organic” vegetables for his dinner. A couple sang of the hard times faced by ranchers being pushed off their lands. One of the final performances involved a line of actors in black suits, each holding a type of vegetable in their palm. The farmers were in a line in front of the “suits,” harvesting as they walked slowly forward. Each line progressed forward and, unexpectantly, the “suits” overtook the farmers. A powerful metaphor for today’s farming practices. The last scene involved a feast where 30 of us were selected to participate. I was one of those lucky 30. We each sat down at specific spots, identified by numbers. Under our bowls were scripts that we were to follow as we participated in the feast. Instead of being the audience, we were the performers. And we were rewarded for our acting abilities with delicious stew and biscuits cooked by a local chef. The finale involved a home-baked apple pie. The audience becomes the performers during the feast at the end of "The Harvest." Most of my script instructed me to make sounds of enjoying my food, which was easy enough to do. I had a few other lines to speak, but the requirement was quite minimal. I was able to pull off my role with great expertise, since I have eaten stew quite frequently over the course of my life. And groaning with pleasure at eating is nothing new to me either. 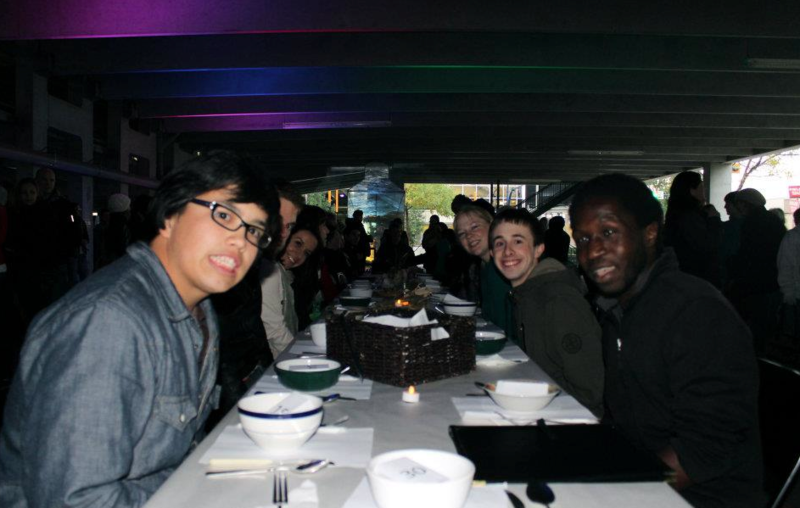 As darkness descended and we finished our meal, we enjoyed the singing of a choir that surrounded us. Definitely an interdisciplinary theatrical project that engaged all audience members in examining where their food comes from. All pictures in this blog were taken from The Canola Project’s facebook page. Wow! This can be one of the most helpful blogs we have ever come across on thesubject. Basically excellent article! I’m also an expert in this topic so I can realize your hard function. Thank you, Ramonita. I appreciate your comments! Hi! Someone in my Facebook group shared this website with us so I came to look it over. I’m definitely loving the information. I’m book-marking and will be tweeting this to my followers! Excellent blog and brilliant design and style. Thanks, Jaunita. And thanks to your friends for sharing. I’m glad that you enjoyed it. You can subscribe. That way, whenever I post a blog, you will be notified by email.